Autonomous, or driverless, vehicles and drones have hit the main-stream of public consciousness. Hardly a week passes without with the national media breathlessly covering the technologies’ developments, including the good (Canadian officials using drones to map and determine the cause of a massive wildfire in May); the bad (a personal drone aircraft landing on the White House lawn last January and May); and the ugly (a fatal Tesla auto-piloted car crash in Florida last June). Closer to the supply chain industry, in the past few years retailers such as Amazon and Walmart have likewise made national headlines for both acquisitions and explorations into potential applications for these autonomous technologies. And, in the 2016 MHI Annual Industry Report—Accelerating Change: How Innovation is Driving Digital, Always-on Supply Chains—released in April and available as a free download on MHI.org—59 percent of the nearly 900 survey respondents say autonomous vehicles and drones are having at least some impact on supply chains. Further, 37 percent believe these technologies have the potential to provide either competitive advantage or to disrupt the industry. With adoption rates expected to grow 50 percent over the next six to 10 years, where within supply chain operations will autonomous robotic vehicles and drones make the biggest impact, and why? That depends on whom you ask, and what timeframe you reference. 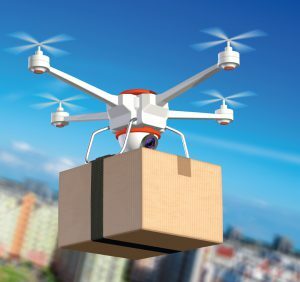 Increasing public awareness of autonomous vehicles and drones serves their adopters throughout the supply chain well, notes Sarah Carlson, vice president of marketing and business development for MHI member AutoGuide AGV, a manufacturer and supplier of automated guided vehicles (AGVs) and tuggers. For operations that are just beginning to consider automating their parcel movement indoors, the public media attention makes it easier for suppliers to explain the technologies’ potential benefits over other technologies, such as fixed conveyor systems, she explains. “Obviously, technologies used in supply chains and warehouses aren’t precisely identical to those available for personal use in the air on the open road, for example,” continues Carlson, who adds that, because of the public exposure, operations people seem to have an easier time visualizing autonomous vehicles in their facilities—and considering the possibilities—than they did just a few years ago.